Bioglan Super Fish Oil capsules are half the size of regular 1000mg fish oil capsules and contain a higher percentage of omega-3, so you only need to take one a day. Bioglan Super Fish Oil is sourced from anchovies in accordance with international regulations and procedures to ensure it is eco-friendly. These capsules provide highly concentrated omega-3 fatty acids. Both EPA and DHA contribute to normal heart function. DHA contributes to the maintenance of normal vision and normal brain function. Take 1-2 capsules daily with water, after food. 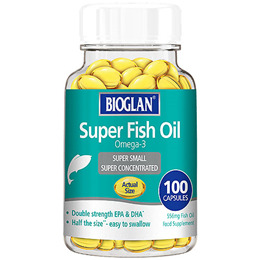 Below are reviews of Bioglan Super Fish Oil - Omega-3 - 100 x 556mg Capsules by bodykind customers. If you have tried this product we'd love to hear what you think so please leave a review.